I’ve noted that there is a small but loyal base of users that use Todour, but quite many download, try once and then never come back. Is it to difficult to use? Or is it just not what those users were expecting? Anyhow, now there is a video showing it in action to both help understand what it is and also understand how it can be used. Hope it is of value. This entry was posted in Productivity, Video on January 19, 2016 by sverrirv. Thank you for providing todour. I tried plenty of apps, but this one nails it perfectly. I use it on a Mac and a manjaro linux laptop at home and on a mac in the office, syncing via dropbox. It works like a dream. If you someday build in auto-completion of tags would be an extra luxury, but it’s good the way it is. > quite many download, try once and then never come back. Is it to difficult to use? Or is it just not what those users were expecting? Hard to say, but maybe some are new to Todo.txt, which is not for everyone. (a) This is the only Todo.txt app for Windows which is usable for me, and which syncs with Dropbox (so I can also use with Simpletask on Android). I *really* appreciate it, and I’m very happy to see that you are continuing to work on it and respond to user requests. Thank you so much. (b) It doesn’t have as many features as Simpletask, especially in terms of sorting and filtering, and saved filters. The date picker and the option to hide tasks before the threshold also make Simpletask very usable. 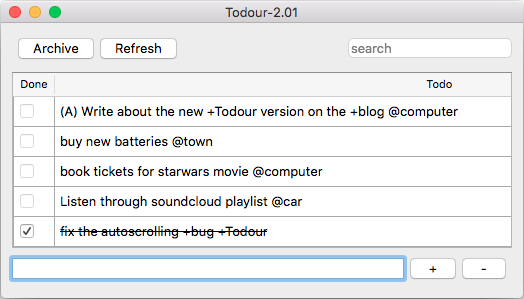 Any of those changes would lead me to using Todour more often, rather than using Simpletask almost all the time. But even as it is, I use it and really appreciate it! Hi. And thanks for your comment. I’m truly glad that you find the application useful. I agree that this isn’t for everyone, and also I’ve kept the application rather free from features so it requires a bit of the user. I will check out simpletasks for inspiration as those kinds of features are rather simple to add. And when it comes to the sorting, it actually isn’t alphabetical except for the prioritised issues. The rest are in the order they appear in the file. I’m playing with change of the sorting right now as it seems to be wanted by many. I realize that this was put out there a long time ago. For what it’s worth… I tried to install your Windows .exe on a work machine, first getting permission to work with Administrative privileges. Symentac popped up and said that your app had not been seen often, and therefore is not trustworthy. It quarantined the exe file, and I didn’t push back. Seems like there is a chicken-and-egg thing here. Thanks for notifying me of this. I have had other reports of anti-virus software having problem with the application, and it mostly seems related to the installer that is used. You could try to download the zip file instead and after unzipping it to for example your home directory or the Desktop, run the Todour.exe that is in there. That requires no Administrator priviledges to do and the installer isn’t there either. I hope you can install it that way, and I will send a copy of my installer to Symatech for whitelisting. Symantech was fast to reply and the file should now no longer be flagged by their system (it can take up to 24 hours to take effect).